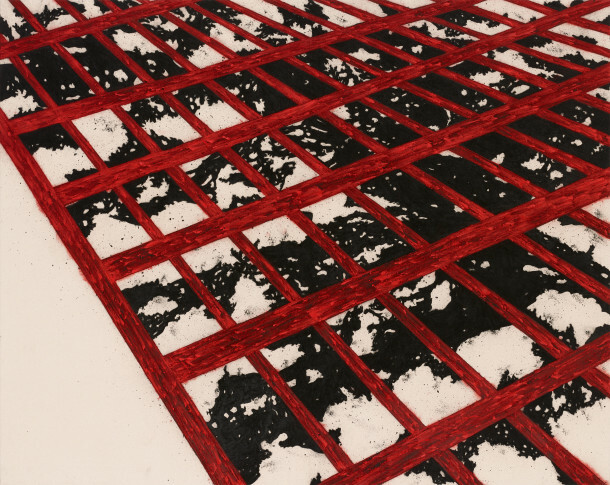 If it is not the clashing red against black or visual remnants of charcoal that captivate the viewer, then it is the fragments of architecture juxtaposed with the bare, skeletal remains of trees that does it. The large scale paintings by Tony Bevan are an interesting blend of representational and abstract elements brought together through the repetition of colour and material. There is something simultaneously structural and yet apocalyptic, as if the works have photographically captured the moment before collapse or the moment after a lightening strike. Some works merely hint at structures like roofs, while the two tones and flat forms, hint at depth and perspective. His pigments are a rich mix of acrylic paint over charcoal. The charcoal that remains on canvas suggests something quite industrial and adds texture, yet on another level it signifies something abandoned, memory or even nostalgia. All of these spaces are devoid of figures and life. They are relics of another time: monuments to industry, workers, unions, mining and perhaps even suffering. Mindy Lee’s title for her works ‘Birth and the Baby Game’ for the exhibition ‘Bodies Undone’, held in the Blyth Gallery, Imperial Arts College, London is possibly as loaded as the exhibition name itself. For most mothers who have experienced birth and babies, they are aware that ‘game’ is clearly ironic and a useful pun suggesting fun but challenge. Or perhaps it is the mind undone, for the game certainly begins there and the mind is after all connected to the body. If the mind or consciousness is removed, if the body is ‘undone’ from its frame, from its skin packaging, then how does it all hang? Birth and babies affect the body physically an mentally. There is ‘hardware’ and ‘software’ involved in this game. So the viewer must ask themselves: ‘What is the body when it is not entirely ours, connected with umbilical cords, almost parasitically; through DNA and genetic labyrinths? Here in this space of creation, two is one and one is two. In Mindy Lee’s fabric paintings, the fabric represents this paradigm of two as one. It is the fabric of the body, of nerves and tissues and fibres. Thus the stitching is symbolically connecting these bodies and these parts, as the two fight to be one or indeed to be separate. The clothing from Lee’s actual pregnancy creates a nostalgic umbilical cord, a fabric or fabricated link. In another way, the clothing, in the act of becoming an artwork, ‘preserves’ the momento, much like mothers who keep their baby’s tag or umbilical cord etc. The process of motherhood and domesticity become part of the creative process, which for parents of small children cannot be separated out. The profession cannot be separate from the maternal role: sometimes there remains a feeling of either beautiful symbiosis and at other times parasitism. But lets be honest, childbirth and procreation are in themselves the elemental and most original form of creation. The other work that caught my attention in the show because of my own recent revival in my own drawing practice, was the charcoal hand gestures of Susan Sluglett. 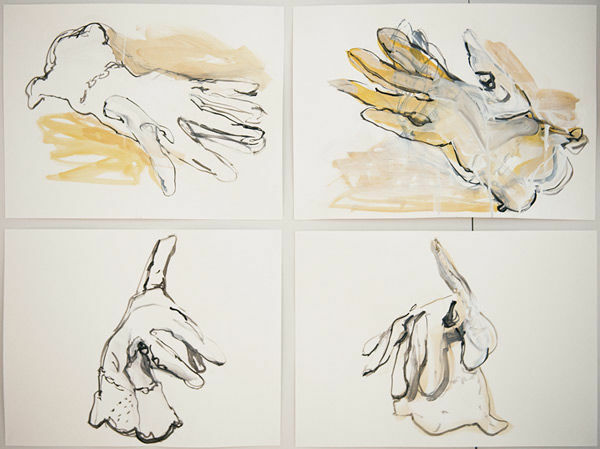 They are a visual exploration of the hand in process, as well as communication. Just as the hand draws lines and erases, so is there a sense of movement in the drawings through the erasing of sections and then drawing on top of this. The smudging becomes a shadow of time. It reminded me of the work of William Kentridge but with signs rather than narrative. The rough lines and working are reminiscent of the artistic process of testing and working with the materials. The way the hands are finished off is not entirely like that of traditional figure drawing studies. They are cut off by a line which makes it appear almost sculptural and connotes a whole new level to the concept of the ‘body undone’. These are not hands, they are gestures, signs, gloves, amputations even – a visual language in line. This historical work by Isaac Julien and The Newsreel Collective is a riveting short film documenting the lives of young people in London. It explores narratives of racism experienced by black and mixed race teenagers juxtaposed with the experiences of right wing working class youths who reflect on their own behaviour. It is a fascinating work that acts as an echo to contemporary views on immigration, illegal immigrants, asylum seekers and of course, the never-ending Brexit saga. The curation of the work displayed an old TV screen works well with the aged footage and yet the elements of nostalgia are distorted because the views and voices of some of these young people are the same voices we are still hearing in parts of London today: nothing’s really changed. I imagine this work as a social time capsule, or an invaluable measuring rod for how far society has come, which, after the Stephen Lawrence’s racially motivated murder in 1993 and recent London riots and murders, is not very far indeed. It is a film primarily concerned with education around racism and multiculturalism but there is a common theme suggesting the real demon is ‘class’. Racism becomes the outlet for inherent social and class divides in British society that lead to poverty and perverse nationalism. The young people discuss issues with autobiographical anecdotes, which add an element of verisimilitude to the mix. The film comprises mostly medium and close up shots of the teenagers and occasionally the audience has the intrusion of the interviewer. The audience is also aware that despite some mediation, much of the commentary is impromptu. It would be great to see this work alongside contemporary films documenting London youth and their informal discussions. Of course, the problem we have in Media today is that even documentaries need to be commercial, even sensational. 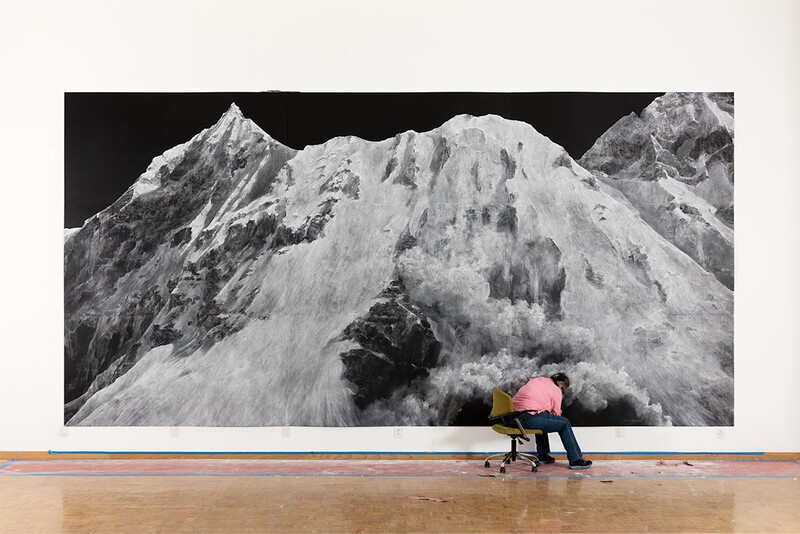 The work is also part of the greater exhibition ‘more of an avalanche’ and acts perhaps as the first ‘snowflake’ that challenges societal norms and propels an eventual political and social ‘avalanche’ for tolerance. It is these liberal ‘snowflakes’ who drove the various civil rights and freedom movements that began in the sixties and seventies. On a personal level, my own experience with Apartheid as a child was brought once more to the surface with terms such as ‘multiculturalism, race, division etc.’ Ironically though, acts of change in a country like South Africa began with ‘snowflakes’ and liberals; however, this was eventually not enough. The avalanche had to come, as Nelson Mandela, said with acts of rebellion, protest and unfortunately violence. A community whose voice is silenced (unlike the young people on the film) will find other means to justice and equality. The London riots are perhaps a testament to this and it would be interesting to re-watch documentaries of this period alongside Divide and Rule Never! (1978). Neon is not new: Dan Flavin, Robert Irwin, Keith Sonnie, Bruce Naumann, Ivan Navarro and many others have explored its potential in artworks. However, this becomes ‘immaterial’, when we walk beneath Cerith Wyn Evans’s massive neon installation, reminded that this is something theatrical, seriously playful; inspired by Japanese Noh theatre or perhaps the high ropes of a travelling circus trapeze. For some, the experience rests in its scale, the sheer vastness of the installation exploding above the viewer like a firework display of signs and splendour. It seems as if it should be hung beneath the night sky and yet it cuts up the architectural space like construction work, as if in doing so, it exposes to the viewer some type of internal organ of light which instead of being hidden in walls and ceilings, is exposed for the first time. For me, therefore, the work cannot be separated from the space, from the high arches and the walls that intrude through it. I want to switch off the lights and walk through it again. But the walk is perhaps not as important as the occasional pauses beneath the forms, allowing the eyes to wonder over the arcs and parabolas which appear more as light drawings than sculpture. These moments were surprisingly meditative. For instance, the concentric circle and the six sided ‘spokes’ in the copula is meant to reference Marcel Duchamp’s The Large Glass, which is a glass work designed to be ‘looked through’ according to Duchamp. The same is true of Wyn Evans’ installation. It is essential to view the work from a variety of points because looking through, as opposed to simply up, opens several other references: it becomes a light code which the viewer must try desperately to unpick as they walk beneath the 2 km of entangled and suspended neon light. Seen from one end it is a mass of lines, a neon nest, suggesting a tangle of optic fibres or a cyber code which has only now been magnified so that the viewer can finally see, rather intimately, the mind of the internet. These light ‘neurons’ are then connected by ‘fibres’ to the ceiling, which gives the entire technical piece an almost organic edge. There is also a random quality to it, as if there is a bombardment of ideas or a scribbling out of automatic thought. Wyn Evans is notably interested in language and coding which has been expressed through the curves like a type of neon cursive. There is also a reference to quantum physics, to light movement and time which all seem suspended mid-air in a type of paused matrix. Several of the lights at the beginning (or is it the end?) seem to have a small separation between them also, like a musical pause, a halt in conversation or an electrical jump across circuits. Perhaps they are the gestures we make in the air between conversation, the unspoken, or the language of movement. If I am honest, I wanted the work to continue, I wanted it to weave in and out of the ceiling and force its way into corners like intrepid spider webs. Perhaps I will have to wait for the next installation and its magical weave. The large hanging canvas with its scale and draped appearance, can be quite daunting when we first view Jessica Warboys’ work. In many respects we are wanting to frame it, stretch it out, even curtain rail it, in an effort to ‘formalise’ it somehow. However, like the sea itself, like a wave that rolls itself out, this canvas refuses to conform. It is both painting and installation. It is interesting that both performance and painting (automatic or perhaps ‘chance’) combine to form something which stands quite monumental, almost theatrical like a stage backdrop. Modernist movements such as Dadaism and Expressionism introduced the idea of creating works by chance but the artists’ hand was somehow still involved. Aside from performing with her canvas in the waves and selecting pigment, the hand that creates the chance in this case, is the sea itself. The sea becomes personified in her work and creates therefore a powerful metaphor for nature’s position in art. It is no longer merely ‘subject’ and the sea is no longer ‘landscape’ but it is now artist suggesting that nature remains powerful and can create outside of and alongside the artist. Another intriguing aspect of her work is the pigments themselves. What I noticed after a while was that there was an absence of blue. Yet I kept seeing blue once I knew that this had been processed in the sea. It is fascinating that many of the colours chosen are warm colours, as if they stand in opposition to the cool tones of the sea itself. The nearest colours to the sea are the greens and purples but the colour that seemed to stand out for me was yellow. Several of the splattered/worked canvases reminded me of Jackson Pollock but perhaps without the layering of pigment and the sometimes ‘uniform’ automatism. Nevertheless where the strength of this work lies, is not necessarily in the final production or display but by ecologically exploring the ways artists can work alongside nature to create works of aesthetic interest.